Norwich XI: Rudd, Martin, Bennett, Bassong, Brady, Howson, Dorrans, Tettey, Redmond, Hoolahan, Mbokani. Villa XI: Guzan, Hutton, Clark, Richards, Bacuna, Westwood, Gana, Sinclair, Veretout, Richardson, Ayew. Jordan Ayew curls one towards the right corner - but Declan Rudd takes care of it. And that's the last touch of the game! All over at Carrow Road. Head here for all the post-match reaction. Thanks for tuning in! Tempers flare. Both skippers go into the book after a melee. Time running out. Five minutes of stoppage time. Five minutes for Villa to produce a miracle. And that is Dieumerci Mbokani's final contribution. The Norwich striker is given a standing ovation as he leaves the Carrow Road pitch moments after scoring. Cameron Jerome is given a run-out. Game. Set. Match. Dieumerci Mbokani doubles Norwich's lead with a firm header from Wes Hoolahan's delightful clip to the far post. But, again, one must wonder where the Villa defence was?! Time to shore things up for the hosts. Gary O'Neil comes on for Graham Dorrans in the heart of the Canaries midfield. Less than 10 minutes for Norwich to hang on for a potentially priceless win. Less than 10 minutes for Villa to salvage something. Final throw of the tactical dice for Aston Villa. On comes Jack Grealish, off goes Jordan Veretout. Villa substitute Adama Traore smartly tricks his way inside the challenge of Canaries left-back Robbie Brady when he cuts in from the right touchline, flashing a shot past the near post with the aid of a deflection. Micah Richards can't head the resulting set-piece at goal. And that's despite using a Norwich defender as a climbing frame. A second Norwich goal would ease the lingering tension at Carrow Road. Nathan Redmond hopes he can be that man as he stands over a 25-yard free-kick. But his effort lacks either the pace or the accuracy to trouble Villa keeper Brad Guzan. The ball is knocked up towards the Norwich six-yard box by Jordan Veretout. But the Canaries defence see that one coming from a mile. They head clear and, after a bit of pinball, eventually hack clear. Adama Traore has breathed fresh life into the Villa side. The winger twice dances into space in the right channel of the Norwich box, only to fail to find a claret and blue shirt with his dinks from the byline. Ciaran Clark has been pretty steady this afternoon - then the Villa centre-back makes an almighty mess, losing the ball close to the halfway line. Norwich have two on two as they pour forward, but Dieumerci Mbokani is dispossessed on the edge of the area by a desperate Clark. Perfectly timed tackle - and it had to be. Pass. Pass. Pass. Possession lost. That pretty much sums up Aston Villa today. Neat and tidy around midfield, but no attacking punch. Ryan Bennett was one of the aforementioned yellow and green shirts that tried to wipe out Jordan Ayew. (Think a failed Benjamin Massing-esque attempt on Claudio Caniggia at World Cup Italia 90.) The Norwich man sees a yellow card wafted in his face. Jordan Ayew is the fella likeliest to haul Villa back into this game. The Ghana international surges forward from deep, a host of yellow and green shirts trying to take him out. They fail, allowing Ayew to go left to Jordan Veretout. His cross is deep and wins an away corner. Dieumerci Mbokani versus Ciaran Clark is shaping up as the individual battle of the day at Carrow Road. Right on cue, Clark does enough to flick clear another dangerous Norwich ball into the box. Time for a change. Remi Garde has seen enough, sticking up Scott Sinclair's number. The winger is hooked, with Adama Traore replacing him. Close! Jonny Howson almost grabs Norwich's - and his - second goal of the afternoon. Brad Guzan weakly slaps out Nathan Redmond's 20-yard shot, only to be let off the hook as Howson guides the ball wide of his left-hand post. No change given by the Norwich defence. Ashley Westwood plants a ball towards the corner, allowing Scott Sinclair to stick on the afterburners. The Villa man is quick....but not as quick as Norwich left-back Robbie Brady. The Irishman wins the footrace as Sinclair clumsily knees the ball out for a goal-kick. Pretty similar to the pattern of the opening stages of the first half. Villa enjoying more possession, but struggling to penetrate the home defence. Tight. Oooh, Villa striker Jordan Ayew goes down in the Norwich box. Few penalty appeals from the Villa players - and rightly so. Ayew is simply outmuscled by Norwich defender Sebastien Bassong, who recovers to stop the Villa man going through one-on-one. Villa don't hold on to possession for very long, Norwich pinging a long ball forward. Villa keeper Brad Guzan takes a dodgy touch, allowing Norwich striker Dieumerci Mbokani to race down his eyeline. The American swipes clear to his relief. A huge roar greets the arrival of the home players, who are followed out of the tunnel by a glum-looking Remi Garde. Can't imagine the Villa gaffer is a teacup-throwing sort of manager, but I reckon - judging by his angry head-shaking - that he used a few choice words at the break. No changes to either team - Villa get this show back on the road. The thrill of seeing that missing Jeremy Goss face beaming back at you, the 'shinies', and the many, many copies of Ian Taylor. Harsh scoreline on Villa. Probably. They have shaded possession, and territory, but find themselves trailing to Jonny Howson's crisp finish. Five minutes for Villa to claw their way back into the game before the break. Norwich are warming up nicely now, getting into their groove like a teenager on the dancefloor. Graham Dorrans is seeing plenty of the ball now, trying to orchestrate another home attack. However, Villa stand firm and win back possession in their own half. Straight from the training ground. Quick-thinking from a home corner sees Norwich midfielder Graham Dorrans race on to the short ball, firing just wide of the post. But honestly...where was the Villa marking? Their defence was snoozing. Can you remember when Micah Richards was a rampaging full-back? The Villa skipper returns to his youth, charging down the right flank, trying to lift his struggling side. However, his low cross into the home penalty area cannot find a claret and blue shirt. Kieran Richardson has been in the thick of Villa's sharpest attacking play (note: sharpest not sharp). Again, the former England man fancies his chances from distance. Again, he can't force Declan Rudd into decisive action. Confidence has visibly lifted among the home players following that opening goal. Graham Dorrans marches forward from central midfield, tries to play a neat one-two with Nathan Redmond, but a Villa foot nicks the ball back. Villa are huffing and puffing but can't blow a hole in the Norwich defence. Kieran Richardson cuts in from the left flank, dancing across the edge of the Villa box. But he can't find an inch of space to get a shot away. It really was a lovely finish from Jonny Howson, but that little yellow blip in the graphic below is where Leandro Bacuna fails to clear. Norwich profit. Can Villa reply? Boom! As crisp a strike as you'll see this afternoon puts Norwich ahead. Nathan Redmond clips up a delightful ball from the left, Villa defender Leandro Bacuna flicking on, straight to Jonny Howson who volleys under Brad Guzan from 10 yards. Norwich haven't managed a shot on target yet - is that about to change? Nope. Jonny Howson's cross from the right byline is headed clear, only as far as Nathan Redmond. A gasp of expectancy goes up around Carrow Road as the ball drops towards him, only for the home winger to shank his attempted 20-yard volley. The most advanced player for Villa so far has been their number 18, Kieran Richardson, but they've been all about the right flank so far at Carrow Road. Villa are taking great heart from that chance, enjoying plenty of possession in the Norwich half. Can they make it count? Virtually nothing has happened in the past 60 seconds. Well, apart from Norwich's Jonny Howson slipping over on the touchline. Seriously. Cagey. Scrappy.Two adjectives you won't be surprised to hear used to describe this opening 10 minutes at Carrow Road. Pretty even in terms of possession and territory as our graphic below shows. Villa win a free-kick on the right flank, about 35 yards out. The big men go up from the back, but Kieran Richardson's inswinging delivery is poor and Norwich thump clear. Slight problem for Villa midfielder Idrissa Gueye, who is limping around in midfield. A wet of the magic sponge should see him right. Kieran Richardson - now there's a name that your average Premier League fan won't have heard for a while. The one-time England man is playing on the left flank for Villa today, pouncing on a cushioned header down from team-mate Jordan Ayew. The ball bounces invitingly for Richardson to crack at the Norwich goal from 25 yards - but it is always rising. What a waste. Norwich's Robbie Brady - usually so reliable with that left peg - slams the free-kick straight into the Villa wall and the away side escape upfield. First shot of the afternoon goes to Aston Villa. Leandro Bacuna lets fly from 25 yards out, home keeper Declan Rudd pushing out. Rather unconvincingly I must say. Micah Richards can't prod in from the resulting corner. Scrappy start as Norwich try to make a few in-roads. Villa centre-back Ciaran Clark crunches into a sliding challenge to win back possession for the visitors. Lively start from the Villans, who surge into the home half. A bouncing ball from a throw-in just evades Scott Sinclair and the home defence clear. Referee Graham Scott puts his whistle to his lips, gives it a short, sharp, shrill blast - and that means we are under way. Norwich, decked out in their traditional yellow and green, kick off. Norwich: Rudd, Martin, Bennett, Bassong, Brady, Howson, Dorrans, Tettey, Redmond, Hoolahan, Mbokani. Subs: Ruddy, Whittaker, Jerome, Lafferty, Olsson, O'Neil, Odjidja-Ofoe. Aston Villa: Guzan, Hutton, Clark, Richards, Bacuna, Westwood, Gana, Sinclair, Veretout, Richardson, Ayew. Subs: Lescott, Traore, Gil, Bunn, Lyden, Gestede, Grealish. Huge cacophony of noise inside a floodlit Carrow Road as the players emerge from the tunnel. Time for the mandatory handshakes, before skippers Russell Martin and Micah Richards meet again - with referee Graham Scott also in attendance - for the coin toss. Some 'inspiring' classical music is blasting out of the Carrow Road PA system as the two sets of players stroll out of the dressing rooms. You know the sort of tune I'm talking about, the kind that is the backing tune to a sob story on a reality TV talent show. 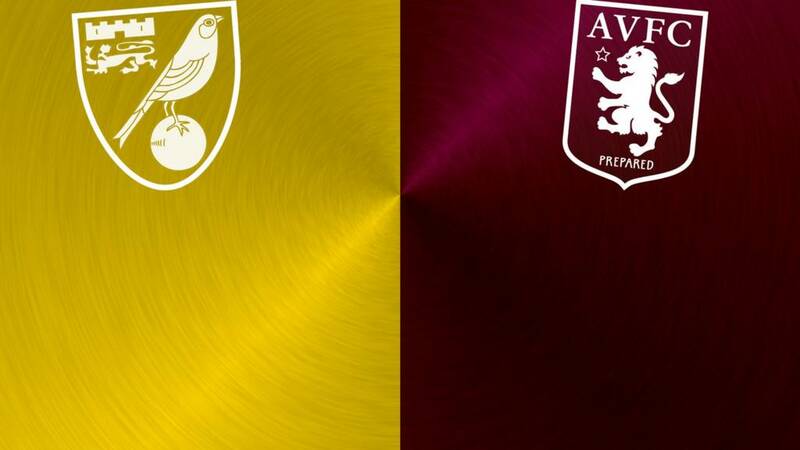 "Aston Villa have a good recent record in matches against Norwich City, which might be a small crumb of comfort for Villa fans ahead of this crucial fixture. "At the moment, Remi Garde can only dream of having the same sort of impact that Alex Neil has had in Norfolk. It has been a memorable 2015 for the Canaries following Neil's appointment in January. "Villa travel to Norfolk having not won in the Premier League since the opening day of the season. With both sides desperate to end the year on a high it is certain to be a tense afternoon." Not many happy faces at Carrow Road, it has to be said. And why would there be when both sides are scrapping about in perilous positions? One of the Norwich mascots - Captain Canary, I believe - is bringing some cheery relief though. The yellow, fluffy bird is earning his corn by helping the home groundstaff, sticking a fork into the turf before kick-off. After beating Manchester United Norwich may have put up more resistance at Tottenham but they were swatted away after a bright start. Now at home, this could be their biggest game of the season because they can get further away from Aston Villa and get up amongst the pack. Villa can't get three points, they don't create enough chances and lack a goalscorer. Villa are already nine points adrift and we will know by the personnel they sign in January whether they honestly believe they can get out of it or not. They will keep going, they will not throw the towel in but they have such a lack of quality it's obvious what will happen to them. We have seen teams turn it around dramatically, look at Leicester last year, but Villa just do not look like scoring at all. They have no goals in them. Any hope of a brighter New Year then Villa fans? Or are you resigned to life in the Champo next season? Villa are nine points adrift of safety (sorry for reminding you), with today's hosts Norwich currently occupying that final safety spot. What about Norwich, Canaries fans? Have you got enough quality to survive? And - both teams - where would you like to see your side strengthen in the January transfer window (and be realistic)? Aston Villa also make four changes from Boxing Day, when they drew 1-1 at home to West Ham. The headline news is the return of skipper Micah Richards, who has missed four matches with a knee injury. Ciaran Clark also comes in to start alongside Richards at centre-half, with Scott Sinclair and Kieran Richardson also getting the nod from boss Remi Garde. Norwich midfielder Wes Hoolahan starts after being left on the bench on Boxing Day, one of four changes from the 3-0 defeat at Tottenham. Striker Dieumerci Mbokani also steps up from the bench, along with midfield duo Jonny Howson and Graham Dorrans. Both sets of players are out on the lush Carrow Road turf, going through their warm-up drills. Not sure what the temperature is in the east of England, but there is a high percentage of glove-wearers in the home squad. Hello! There has been little festive cheer for either Norwich or Aston Villa fans this Christmas. Well, admittedly, it has been much bleaker for Villa than their hosts today. The Villans have not won in any of Remi Garde's seven matches at the helm. In fact, they haven't won in any of their past 17 matches. Norwich have mustered one win in their past six games (although that was a stonking 2-1 success at Manchester United). Something has got to give today. Hasn't it? Welcome to our live page for Norwich v Aston Villa. We’ll have live text commentary here from 14:30 GMT. You can keep up to date with all the build-up to today’s games here.